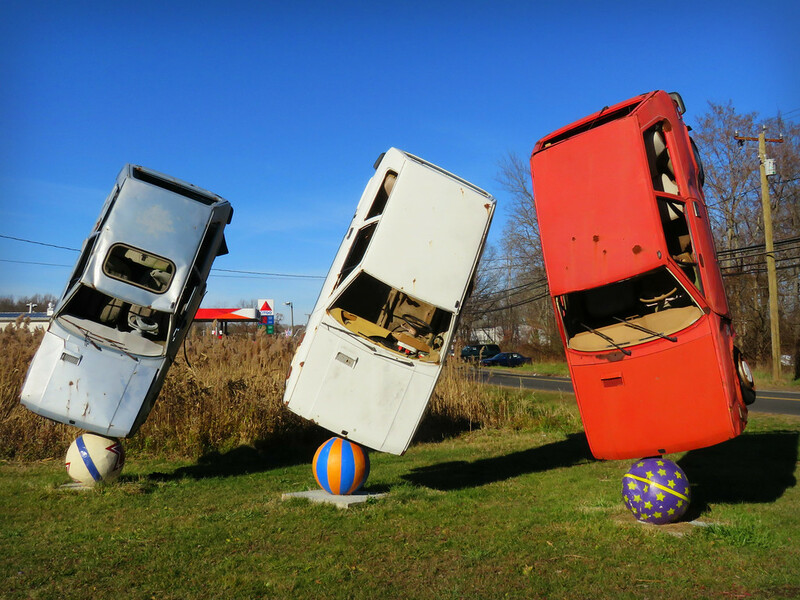 On a chilly day, what better way to warm your heart than with some roadside Americana? I present to you… Balancing Yugos. When I was a teenager, I worked in a shoe store. My boss there had a Yugo in a color that is probably best described as “caucasian.” Stretched across the top of the windshield? A neon green lightning bolt sticker, of course. Because Yugos were all about speed and performance (in a not-so-speedy or performancy sort of way). 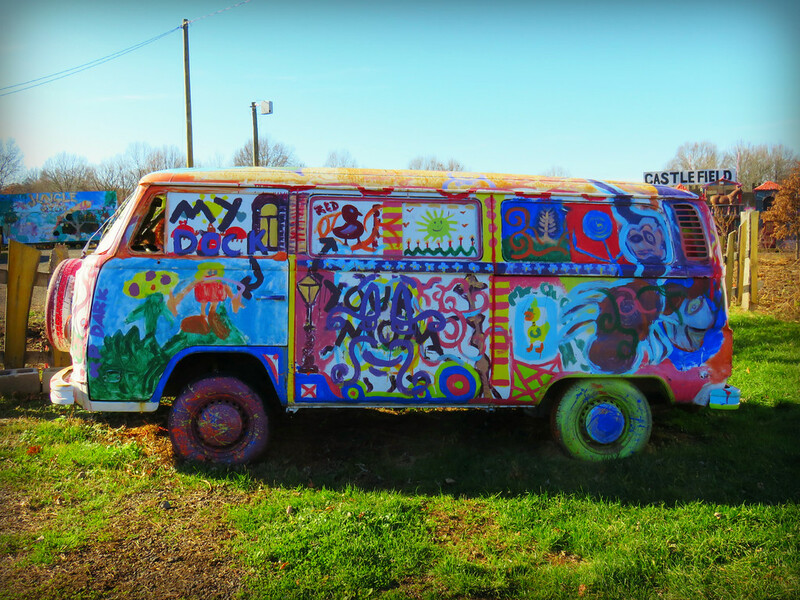 Just across the parking lot from the balancing Yugos was this painted V-Dub. Roadside jackpot. When you don’t know what else to write, there is one tried and true phrase to fall back on. Two words that in their brevity say so much. Yes, keep this pair in your back pocket and you will never be stymied by profundity. Too fun! 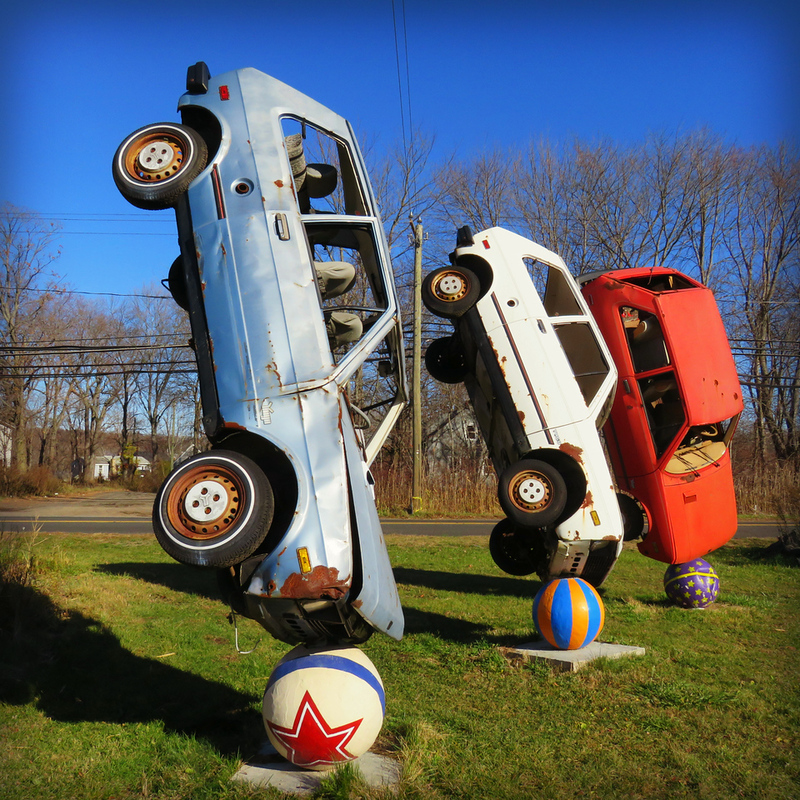 I’m enjoying your roadside attraction posts. Nice collection of auto-strangeness. 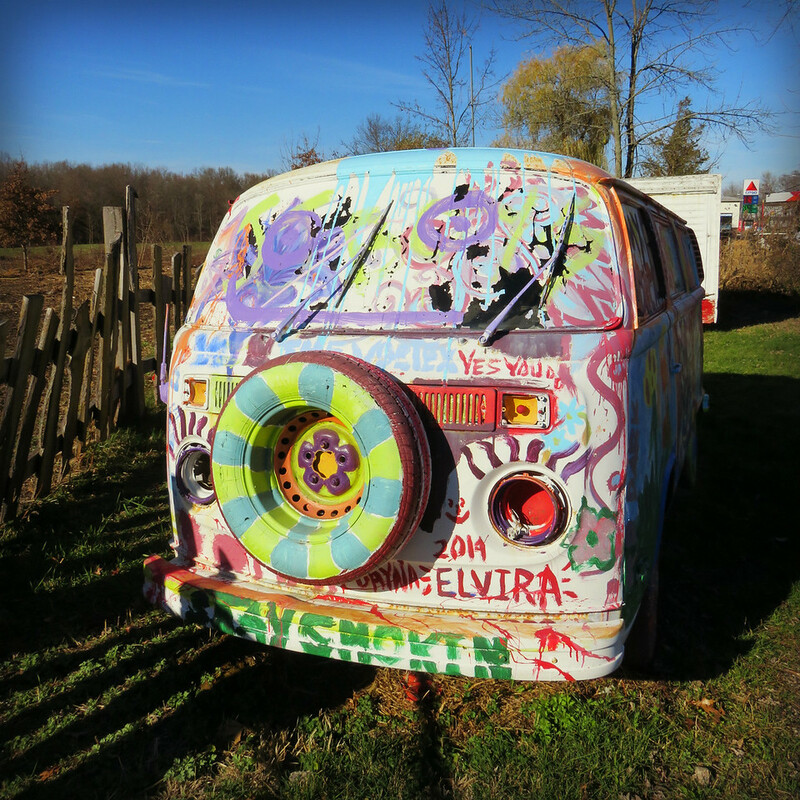 I think I’ll always like VW buses…. Yeah, they’re eternally cool. I’m trying to remember if i’ve ever even been inside one… don’t think so. Ha-haa! …trying to remember if you’ve ever even been inside a VW bus. There will forever be a soft spot in my heart for the good, old Vee-Dub bus. 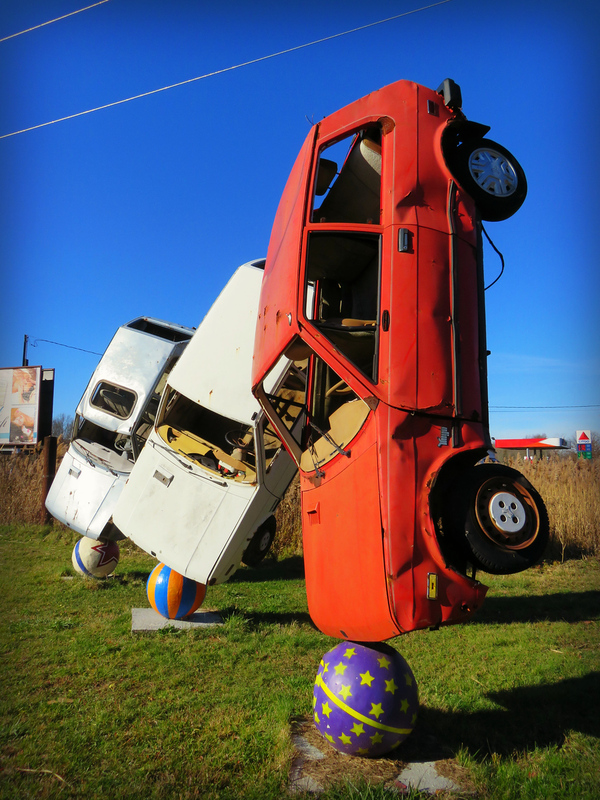 You know the saying…..If you remember the 60’s you really weren’t there……………Ah, the Yugo, That’s all I can say about it. 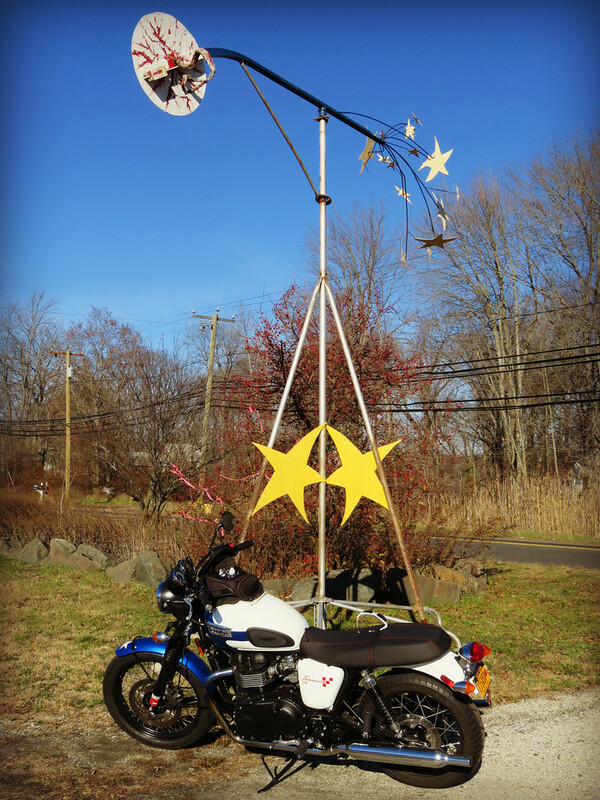 I lived in CT for six years and never came across the cool roadside stuff you are posting. Excellent! That would be a good stop. There are other things in the parking lot which are equally (if not more) interesting. Clearly a labor of love on your part. Will be checking in regularly. http://www.billsbikebarn.com/, which is located in Bloomsburg, Pennsylvania. More than just bikes, it is a huge warehouse of an eclectic mix of all items Americana. The place is so huge that its owner actually LIVE inside of it, not to mention the fact that they are the sweetest people you ever want to meet. Sorry to add to your bucket list, but, as they say, "Payback is a….."
Thanks again. I really enjoy your blog.